We offer parking in front of the lodge on both the right and left sides. There is no fee for parking. We offer a variety of activities including golfing, horseback riding in the summer, dining, birding, biking, mini golf, treatments at our luxurious spa, and activities at our sports center including: swimming, volleyball, pickle ball, basketball, tennis, fitness classes and equipment, air hockey, seasonal kids crafts, billiards, and horseshoes. Some of our county’s main attractions include Crater Lake National Park, Lava Beds National Monument, Crater Lake Zipline, and Collier State Park. Yes, we allow pets for a $30 fee per night. Please call ahead to request a room or vacation rental that is pet-friendly as we have a limited amount available. Guest laundry is located on the first floor near the ice machine. Can I get a rollaway bed or crib? 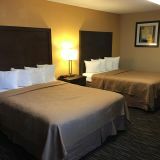 Yes, rollaway beds are $20 per night and cribs are $15 per night. We recommend that you call ahead of time and request one as we have a limited amount. Where can I leave my keys at check out? Please bring your keys to the front desk upon checkout. What does the market have? The market in the village offers a select supply of groceries, liquor, and espresso. Do you sell or accept gift cards? Resort gift cards are available through the Front Desk and are redeemable at the Ruddy Duck Restaurant, Sandhill Spa, the golf course and the lodge. Is there a restaurant on property and what are the times? The Ruddy Duck Restaurant is located inside the lodge at Running Y Ranch Resort, and is open for breakfast, lunch, dinner and a full bar. The Ruddy Duck features a Pacific NW/ New American style menu that includes various regional meat, game, poultry, and seafood dishes; along with more casual classics such as Fish & Chips, burgers, pizzas, and salads. The restaurant opens at 6:30am and closes at 9:00pm. We offer Happy Hour Sunday through Thursday 3:00pm-6:00pm. Happy Hour specials include $1 off draft beer, wine by the glass, and well drinks; Happy Hour discounted food menu that includes 1/2 off artisan pizzas, popcorn shrimp, and several other rotating appetizers. We suggest casual to dress casual attire. Shirt and shoes are required. Please, no bathing suits or sleepwear. We accept reservations for all meal periods and strongly suggest them for weekends, peak periods, and special events. Call 541-850-5582 for reservations or visit runningy.com. Do you offer outside/patio dining? 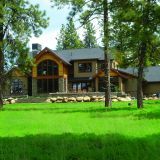 We have a 52-seat patio with spectacular ranch and golf course views open during Spring/Summer seasons as well as a 8-seat fire pit open year-round for cocktails. Where is a coffee shop? The Ruddy Duck offers espresso drinks, juices, and pastries from our Coffee Bar between 6:00am - 2:00pm. We offer breakfast packages that can be purchased when you book. Click here to book now and save. Is room service all day? What are the hours for the restaurant and bar? Where can I get food after 10pm? The gift shop offers select items 24 hours a day. Where is the pool and spa and fitness center? The pool and spa are located in the Sports and Fitness Center, about a two-minute walk from the lodge. *Must be 18 or older to use the pool during adult time. The spa is open from 9:00am-6:00pm Monday through Saturday and 10:00am-3:00pm on Sundays. However, some of our therapists are happy to work earlier or later to accommodate client’s needs. While we welcome walk-in clientele, please call in advance to ensure availability. Is there an age limit at the spa? There is an age limit of twelve and above for spa treatments, however, younger children are welcome as long as they are accompanied by a parent. Call the spa desk before making appointments for children younger than twelve. Do you offer wedding parties at your spa? Absolutely - call in advance to make sure we have the availability to accommodate your wedding party. How many golf courses do you have? We have one golf course, and that is our Arnold Palmer Signature Golf Course. Can u play 9 holes? How much is mini golf? Is there a dress code on your golf course? Please wear a collared shirt. Our golf rates vary on when you stay. Click here for rates.